Ambient DJ Service: A Musical Celebration of "Yuri's Night"
A Musical Celebration of "Yuri's Night"
Today, April 12th, commemorates the 50th anniversary of the human exploration of space. 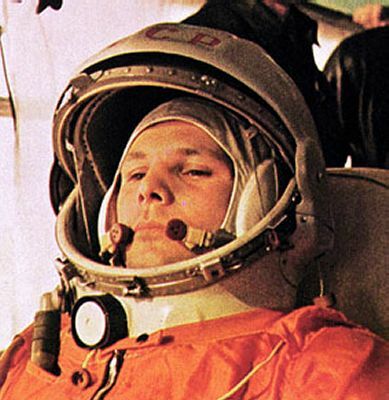 Russian astronaut Yuri Gagarin was the first human being to journey into outer space, when his Vostok spacecraft completed an orbit of the Earth on April 12, 1961. Sadly, Gagarin was killed during a jet accident in 1968. To honor Yuri and his accomplishments, every April 12th global dance communities celebrate "Yuri's Night." For 2011, 217 such parties are being held in 57 countries across the world. For more information, visit www.yurisnight.net. It is amazing to marvel at the progress man has made in just 50 years. Currently Richard Branson's Virgin Galactic is booking trips for the public to travel into outer space! While fares ain't cheap, this is an exciting development. To make a reservation, visit www.virgingalactic.com. If asked to DJ a "Yuri's Night" party, here are some tracks that I might put into the evening's mix. Many of these selections are futuristic electronic productions. Richard Branson, if you're reading, I'd love to be your resident DJ on Virgin Galactic! Thanks. Ambient DJ's Royal Wedding Special!